Assemble the band and pin (but do not sew it) to the cardigan as set out on Page 6 of the Maple Cardigan Sewing Instructions, matching the band seam with the centre back notch on the cardigan. Unpin the bottom edges of the band from the cardigan a short way up on each side. Trim the seams in half, turn the bottom of the band right sides out on each side and poke the corners neatly into shape with a chopstick or other blunt implement. Press. Press the seam towards the cardigan. Attach sleeves and sew side seams (if you haven’t already). Hem at wrists and your beautiful banded cardigan is complete! Fabric: "Dainty" Double Brushed Polyester Knit Fabric from Lush Fabrics Australia (Hint: If you haven't sewn up one of these cardis with Double Brushed Poly fabric you really should. It's soooooo (!) soft. Lots of you have asked how to sew your Leilani Romper for Girls with elastic straps or elastic ties so that the romper is super easy to get on and off. Adding elastic to the shoulders is a simple pattern hack which is great for all ages but especially for teeny little romper wearers who are potty training or learning to be independent dressers. Before we get down to business with the tutorial (check it out in the next post here) I hope you'll enjoy all these lovely pics of our very own Leilani Romper made with the fixed elastic straps in a cute sailing boat print rayon. All the planets aligned for our photo session: a sunny late summer afternoon; a model who was in the mood for some serious posing and a little car trip which had been planned to Sydney's beautiful Rose Bay Wharf - the perfect backdrop. It's a LONG way to London from here!! Thanks for visiting and don't forget to check out the tutorial on making the Leilani Romper for Girls with elastic straps or ties in our next blog post. And if you make one we'd love you to drop into the Peach Patterns Sewing Group and share some pics with us or share your photos on Instagram and tag them with #peachpatterns #leilaniromper. This is the second part of a two part blog series about the Peach Patterns Mama Leilani Top & Dress PDF Sewing Pattern. In this part we're covering everything you need to know to choose the best fabric for your top or dress. The series also covers pattern options, sewing tips, design inspiration and blog reviews in Part 1 (here). The key to getting a great finished top or dress with the Mama Leilani pattern is choosing the right fabric. The main feature of the design is the ruffle overlay and in order to create the pretty folds you are aiming for with this feature its important to use a fabric that will behave in the right way when being worn. This is especially so with the women's dress as there is the added consideration that the overlay needs to drape over our curvier figures. The favourite fabric choice for this pattern is undoubtedly rayon (also known as rayon challis or viscose) as it will give you the optimum drape and flattering silhouette. All of the big chain fabric shops and loads of online sellers now carry rayon in a huge range of both prints and solid colours. Rayon can be a little more challenging to cut and sew than cotton. The best tip for cutting your pattern pieces when using rayon is to find as large a surface as possible and spend extra time smoothing your fabric out and aligning the selvedges. Use plenty of pins AND fabric weights. If the fabric does shift a little and you find your matching pieces are slightly different, pin them together and trim them to match before sewing. If you are up for a challenge and want to create a pretty, special occasion dress you may want to have a go at using silk or crepe for the pattern. The advice about cutting and sewing fluid fabrics (see rayon) applies even more here! If you are going with a cotton fabric, avoid any mid weight to thicker cottons such as patchwork, quilting weight cotton and broadcloth. Instead choose soft and light weight options like voile or lawn or tencel. Indian style block print cottons are another fabulous choice as they usually come on a base cloth which is super soft to touch and comfortable to wear. No matter which fabric you choose, don't forget to wash and press it before cutting your pattern pieces. Many of the fabric types discussed here will shrink after washing and this is especially so for rayon. I have used and recommend Sew Squirrel. A search on Etsy for "rings and sliders" and/or "bra making hardware" will bring up several US sellers of these supplies. Arte Crafts is one we found which offers a good range. Another tip shared in the Peach Patterns Sewing Group is to recycle rings and sliders from old bras or lingerie that you’re no longer wearing. And that's about it for now! I hope you've enjoyed reading this series and if you make yourself a Mama Leilani Top or Dress please hop over and share it in the Peach Patterns Sewing Group and/or on Instagram with the hashtags #peachpatterns and #mamaleilani. Sewing perfect gathers between the bodice and skirt on your Pearlie Dress or Peplum Top isn't hard and will give your finished dress a truly professional edge. There are several ways to get nice even gathers when sewing knit fabrics but the one we use in the pattern is a real "game changer" (I'm quoting the Pearlie pattern testers here!). This method is also an especially good confidence booster if you're new to sewing with knits because it's simple and has such great results. 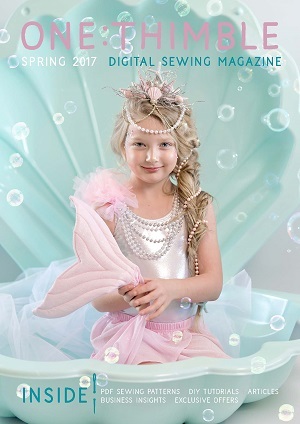 This tutorial outlines the very first steps you will take to sew your Pearlie Dress or Peplum after cutting your fabric pieces. Taking a bit of extra time and care here will set you up for success with the rest of your sewing. NOTE: There are two bodice and neckband options in the Pearlie Dress pattern and for this version I used the "relaxed fit" bodice and the "standard" neckband. The dress was made in a straight Size 8 and the fabric details and links are at the end of the tutorial. The things you'll need are a stretch needle, your regular thread, some shirring elastic and an empty bobbin case. Insert the stretch needle into your sewing machine shank and thread it with your regular thread. Take the empty bobbin and wind your shirring elastic around it by hand until the bobbin is full. The idea here is to wind the elastic on firmly but without stretching it too much. Load the bobbin with your shirring elastic into the bobbin case as you would with regular thread. Set your machine to the longest stitch length. On the right side of your SKIRT FRONT and BACK pieces sew a row of stitching just under the top raw edge. (Make sure you start (and finish) sewing just over 1cm (3/8") in from the side seams (as marked on the pattern pieces). This will ensure the seam allowances at each side of the dress are free of gathers. And yipeee (!) you'll notice the fabric will begin to gather a bit as you sew. The real magic starts, though, when you sew another row of stitching just under the first one. Hold the fabric as flat as possible without stretching it too much and sew completely parallel to your first row. Your fabric will gather up nicely - step back to admire! Your shirring elastic will most likely have done the trick to reduce the width of your skirt pieces to match the width of your bodices. You can check this by laying the pieces parallel as in the photo below. If they're still too wide, however, simply lay the skirt pieces on your ironing board and give the gathers a few shots of steam while holding the iron just above the fabric (don't press the actual fabric). Fold your BODICE and SKIRT pieces in half and mark the centre of each with a pin as shown in the photo below. A little word of caution here so you don't do what *someone I know* (ahem) once did whilst sewing her Pearlie Dress i.e. sew the BODICE FRONT and SKIRT BACK together. The SKIRT BACK is the longer of the two skirt pieces and needs to be matched with its partner, the BODICE BACK. Taking your SKIRTS and BODICES, match the centre points marked by your pins and aligning the raw edges, pin your pieces right sides together. I use LOTS of pins and remove them as I sew! Sew your skirt and bodice pieces together just under the second row of gathering stitches. For the sake of precision I use a regular machine to do this step and then finish the seam with my overlocker (serger) afterwards. And that's really all there is to it! After a quick steam and press with your iron (lay fabric wrong side up and press seam upwards with tip of iron), you have gorgeous gathers and (after doing a little happy dance!) can go on to sew the rest of your Pearlie Dress. The knit fabrics used for this Pearlie Dress are Art Gallery Solids in Crystal Pink from Bebeloush Designs for the bodice and Rainbow Pastel Watercolor Moroccan by Micklyn on Spoonflower for the skirt. (I chose the Spoonflower Cotton Spandex Jersey as my base fabric for this print). Don't forget to grab your copy of the Pearlie Dress sewing pattern over at One Thimble!